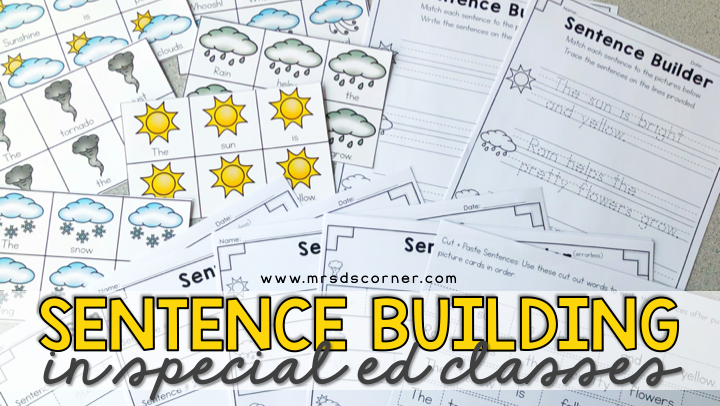 Do you have students in your special education classroom who struggle with writing sentences? Or maybe they struggle with putting words together to form a sentence? Today I would like to introduce you to Sentence Building. This resource was created out of a desperate need for my own self-contained classroom. Students in my classroom, verbal and nonverbal, were struggling with sentences… writing them, putting them together… the whole nine yards… but they had IEP goals to meet and I had zero curriculum to help them achieve their annual goals. I understand both you and your student’s frustrations. Writing sentences is tough! There’s so much that goes into it, but it is a life-long skill our students need to learn and master. You can use this full-year resource to teach students how to write a sentence, or to reinforce the skills through interactive sentence building practice. These leveled activities can be used in small or whole group, in literacy centers, as morning or word work, in sensory bins or in intervention groups. improve comprehension and writing skills. 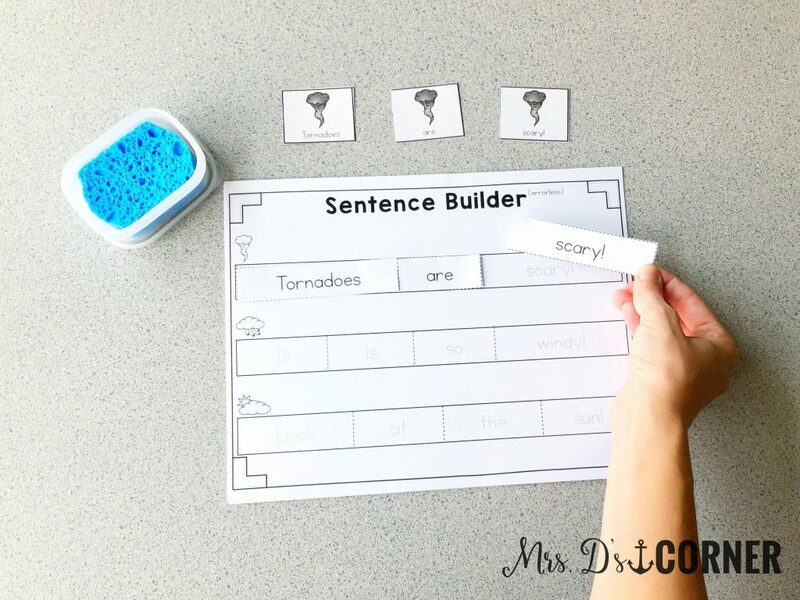 Other skills practiced when using Sentence Builders: capitalization and punctuation, letter formation, spacing between words, parts of speech, cutting and gluing practice, and more! • 5 levels of differentiation, print and implement ready! How is this resource differentiated to meet the needs of all of my learners? Level 1 – 6 sentences with 3 or 4 words per sentence. Level 2 – 6 sentences with 6 words per sentence. Level 3 – 6 sentences with 8 to 12 words per sentence. So let’s take a look at how it works, the different levels, and the recommendations for use in the classroom. There are 6 sentences within each level. This is Level 1, so each sentence has 3 or 4 words. I recommend printing these cards on cardstock and laminating so you can reuse them each year. Have students work on one sentence at a time. 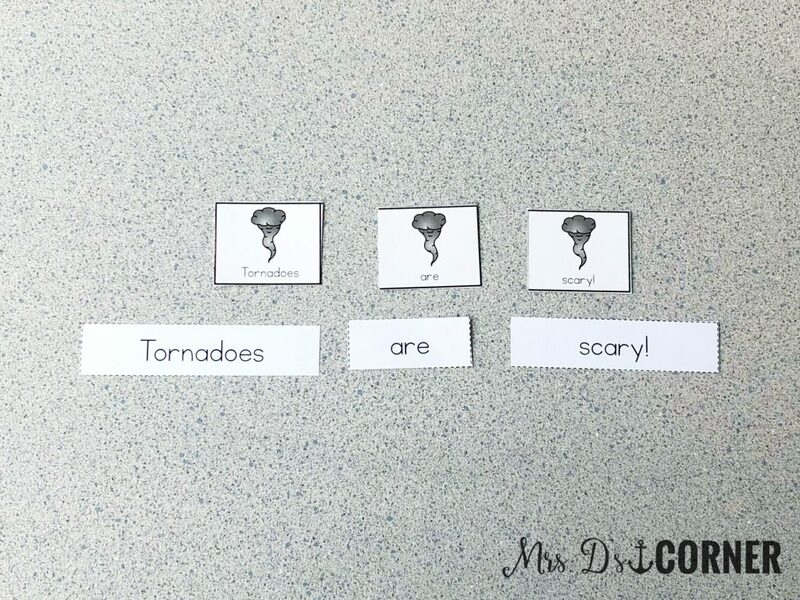 Using the picture cards, have students put the words in order to form the sentence correctly. Next is getting the cut and paste worksheet ready. For some students, I will have them cut their own sentence strips apart. For others (or if we are short on time), I will cut them out (typically while they are putting the sentence together). Now it’s time to paste! With this worksheet, there are 4 options available. As shown (errorless, with pictures), errorless with words, and just pictures or just words. Having these different levels of differentiation will help you meet the needs of all learners in your classroom, while working on the same thing. Paste the sentence strip onto the worksheet. We love using our glue sponges! 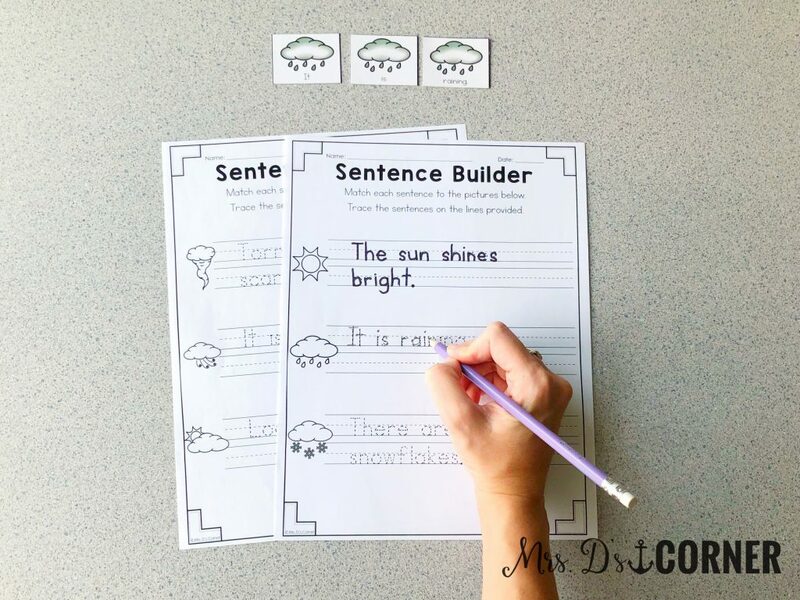 This first step, putting the sentences together and cutting/pasting activity, is typically done on the first and second day of writing instruction. As we move into day two, start by having students put the sentences in order again. You can mix all of the picture cards up, have students sort the cards, and then put the sentences in correct order. Then you will move into the third day of writing instruction with either the trace or write Sentence Builder (depending upon student skill level). 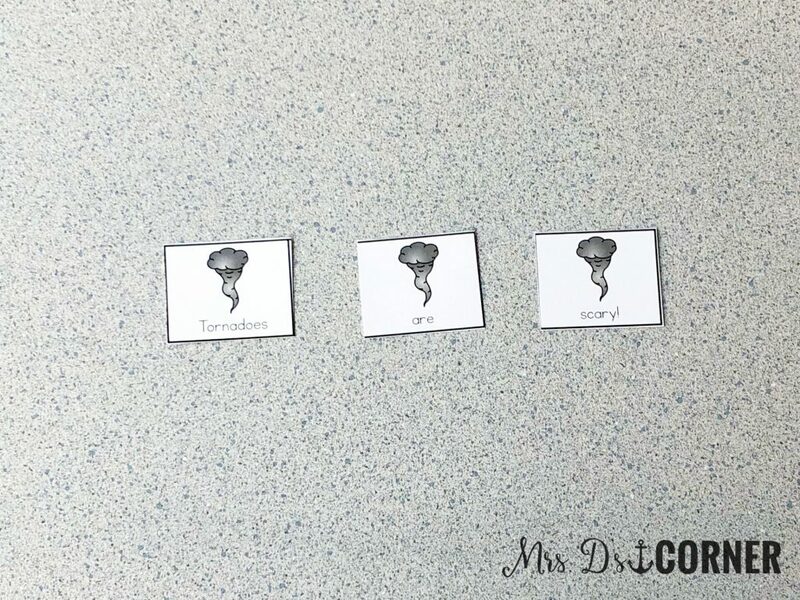 Students will use the picture cards as a model to write the sentence in correct order, as well as spell all of the words correctly. 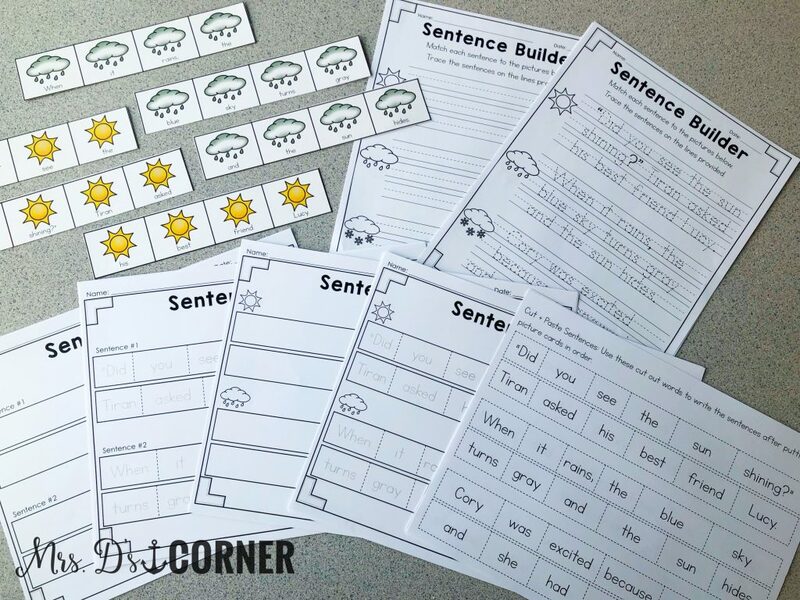 Typically if students finish early, we have this “extra” Sentence Builder activity to complete… and sometimes we will complete this on a Thursday if we’ve completed the rest of our writing work. This challenge activity provides two options for students. One, use the words given with each picture to write 2 new sentences about that picture with the words. Two, the extra challenge at the bottom asks students to write their own sentence about each image. This really gets students thinking outside of the box and gives them an opportunity to showcase lesson mastery and creativity. Level 2 – each sentence has 6 words per sentence. All of the activities are identical to Level 1. 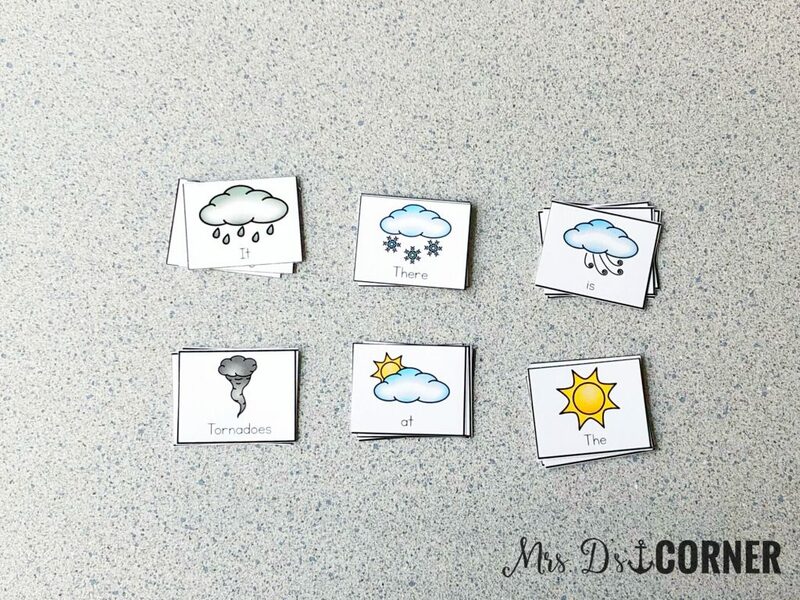 You can easily have students working on the same week’s topic (this post shows the weather set), but on different levels. All of the images are the same within each level, but the sentence difficulty increases. Level 3 – each sentence has 8 to 12 words per sentence. All activities are, again, identical to Level 1. 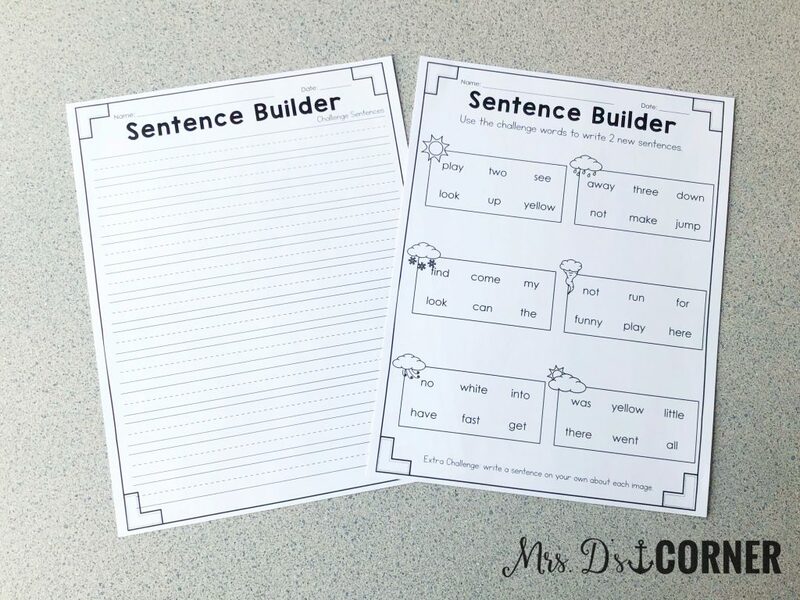 What are other teachers, like you, saying about Sentence Builders? 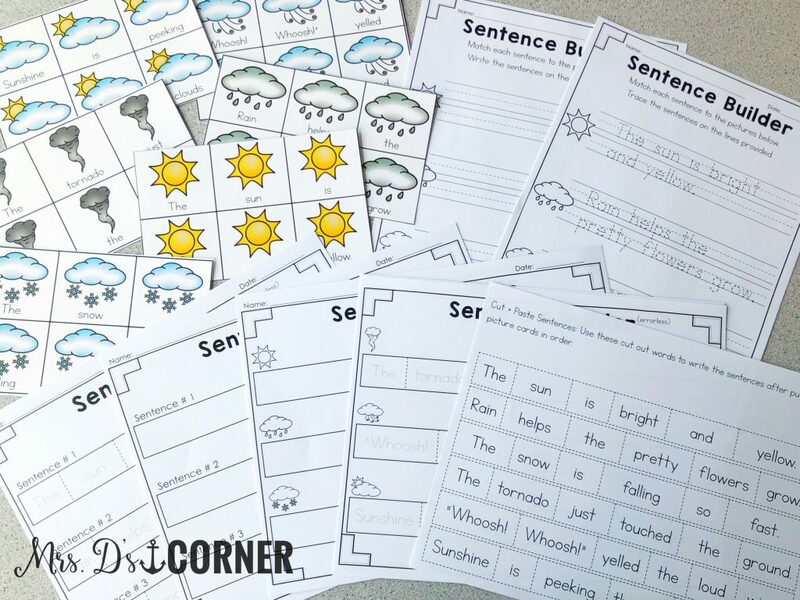 “The sentences are formulated in such a way that they work on sentence structure as well as grammar and can also be used as comprehension activities if you come up with questions for them.” – Samantha W.
“I am so excited for this resource!!! Differentiating writing in my class is challenging as they just want to copy each other. Now they have their own personalized stuff.” – Macy B. “What a wonderful, comprehensive resource for writing! I love the differentiated levels- all of my students will be able to participate!” – Annie A. If you’d like to try a set out for free, you can download a free set of Level 2 in the Resource Library.